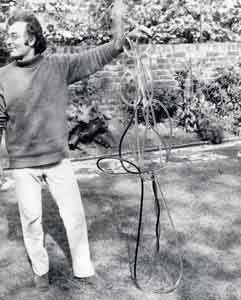 This work was auctioned at Bonhams (London) on 28 April 2005. 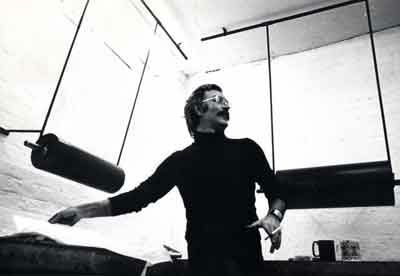 It is with immense pride and pleasure we present this unique website featuring a rare collection of artworks by the distinguished late Iraqi artist Issam El-Said as well as an insight into his background, intellect, artistic and scholarly achievements during what was a relatively short life span, where he died in London 1988, at the age of 50. 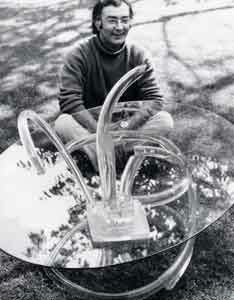 Born in Baghdad 1938, Issam El-Said was the son of Sabah Nuri El-Said (Iraqi) and Esmat Fahmi (Egyptian). His Paternal grandparents were Nuri El-Said Pasha (Iraq's prime minister from 1930-58) and Naima Al-Askari (Iraqi). His Maternal grandparents were Ali Fahmi Pasha (Egyptian) and Nur-Sefa Celik (Turkish). He had one brother; Falah El-Said who married Nahla Al-Askari and had Sabah; then married Dina Maher and had Sima and Zeina. 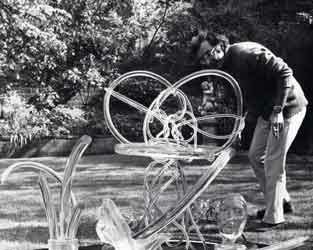 Sadly, Issam El-Said died in London, 1988 at the age of 50. 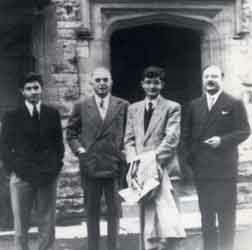 Issam between his grandfather Nuri El-Said and father Sabah El-Said with his brother Falah El-Said, 1956. Achieved a BA Architecture from Corpus Christi College, Cambridge in 1961; studied art at Hammersmith College of Art and Design, London in 1962-4 and prepared for a PhD on the Methodology of Geometric Proportioning in Islamic Architecture at the University of Newcastle-upon-Tyne in 1988, which was sadly not completed due to his untimely death that year. 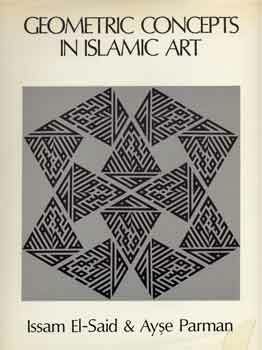 Key extracts from his thesis however were published by the Issam El-Said Foundation in a book entitled Islamic Art and Architecture: The System of Geometric Design,1993. El-Said was the co-author of Geometric Concepts in Islamic Art, published by the World of Islam Festival, London, 1976 and contributed numerous articles on Islamic art and architecture which were published in Europe and the USA. The creative work of Issam El-Said in the form of painting, sculpture, printmaking, calligraphy, design and architectural projects shows his dedication to the expression of the Islamic cultural identity. 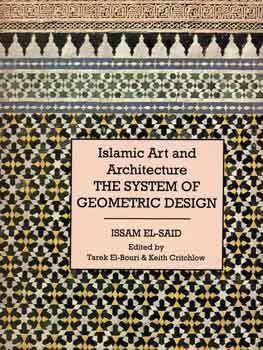 El-Said’s fascination for geometry – the vocabulary and language of Islamic art - manifested itself in the design concepts for constructing geometric patterns determining a formula used by craftsmen and master builders in Islamic art and architecture, which avoids the use of complicated mathematical calculations. This involvement developed alongside his understanding of the essence, beauty, perfection and harmony found in the Islamic arts and architecture irrespective of the region or era and he delved into theory and practice to reconstruct their elements, all of which endorsed his theory that ‘all Islamic arts were governed by the science of preparations in the realm of metre, rhythm and in the form of interval in music’ as developed by Moslem scholars and draftsmen. El-Said demonstrated wonderfully, through both his personal life and creative work, that the spiritual values of Islam can be integrated with the practice of art and architecture. The artist’s mother, the late Dr Esmat El-Said said ‘The unforgettable scenery of his country made on him a deep impression which haunted his imagination during his entire life. 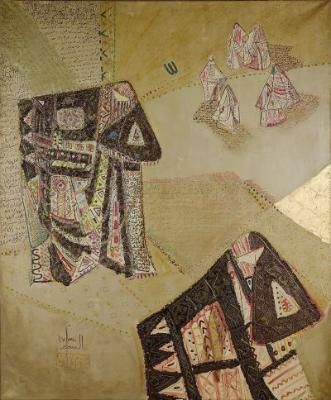 Not only the bright colours of the sky, the golden rays of the sun, the sparkling stars over the endless horizon of the desert, but even the torrid heat of summer and the suffocating sand-storms which often swept across the desert were deeply embedded in his mind.’ Issam El-Said’s artworks are in private and public collections world wide including the British Museum, Victoria and Albert Museum, London; Museum of Modern Art, New York; National Museum of Modern Art, Baghdad; National Museum of Modern Art, Amman. A limited number of copies of the following books are available for purchase. Please Contact Us for further details. In both English and Arabic. Containing over a hundred colour plates illustrating El-Said's work, including many of his own paintings and drawings, and with written contributions from members of his family and colleagues in the art world, this book is a celebration of Issam El-Said's life and art. This study traces man's approach to measurement, outlines the geometric concepts of design and shows how they apply to different fields of Islamic art. The distinct character of Islamic art has been sustained throughout centuries & across diverse eras, regions & cultures, by geometric concepts of composition. 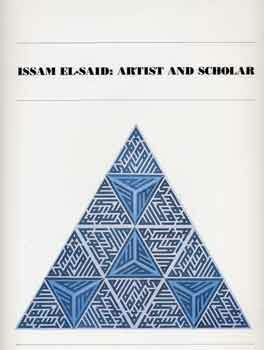 In this book, Issam El-Said pinpoints the rules of composition that form the basis of this unity & shows how intricate patterns are based on these principles, rather than complex trigonometry & formulae. Chapter I presents graphical analyses of numerous complex patterns, to reveal the numerical rationale behind them.  In Chapter II, the author analyses the system of measure used in Ancient Egypt, before the use of numbers for calculating measurements. He shows how measuring cords & a geometric method based on a grid-pattern originating from the circle were employed by master craftsmen in the design of Islamic art & architecture. Overall, the book offers an insight into how craftsmen & designers in the Muslim world have achieved monumental feats of artistic expression with harmony & precision, using the simplest of tools such as a ruler & string & templates, together with a system of measure that is both simple & sophisticated, & as such embodies perhaps the true essence of beauty. 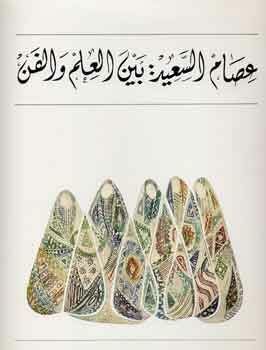 The displayed text/artwork (or variations of it) is featured in the book Issam El-Said: Artist and Scholar. To purchase the book or any of the artworks illustrated in this website (unless otherwise indicated) please contact us.